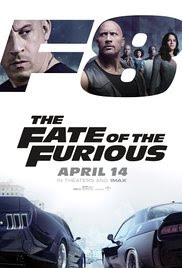 The Fate of the Furious (PG-13 for profanity, suggestive content, and prolonged sequences of violence and destruction) 8th installment in the Fast and Furious franchise finds Dom (Vin Diesel) and Letty (Michelle Rodriguez) settling down after their honeymoon only to have a mysterious woman (Charlize Theron) seduce him into a criminal betrayal of those closest to him. Ensemble includes Helen Mirren, Tyrese, Ludacris, Dwayne Johnson, Jason Statham, Kurt Russell and Scott Eastwood (Clint's son). Little Boxes (Unrated) Cross-cultural drama chronicling the challenges faced by an interracial couple (Melanie Lynskey and Nelsan Ellis) with a son in the 6th grade (Armani Jackson) when they relocate from Brooklyn to a lily-white suburb in the Pacific Northwest. With Janeane Garofalo, Miranda McKeon and Oona Laurence.